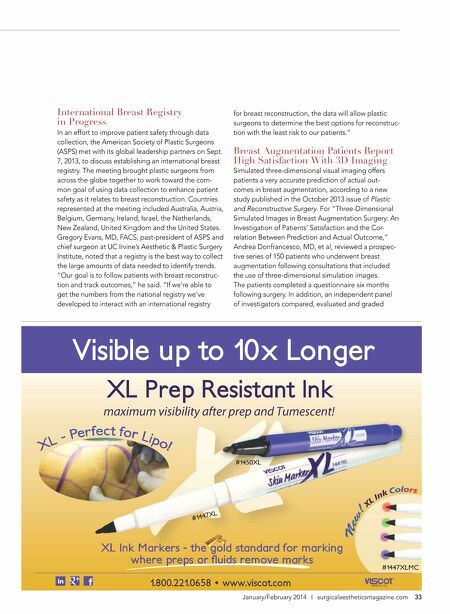 For plastic surgery and cosmetic surgery trends, techniques and equipment, plastic and cosmetic surgeons turn to Surgical Aesthetics for the latest on breast augmentation, liposuction, rhinoplasty and more. News & Events ASPS and PSF Presidents Announced Robert X. Murphy, Jr., MD, assistant chief medical ofﬁcer at Lehigh Valley Health Network in Allentown, Pennsylvania, and professor of surgery at Morsani College of Medicine, University of South Florida, has been named president of the American Society of Plastic Surgeons (ASPS). He took ofﬁce in October at Plastic Surgery The Meeting, the society's annual scientiﬁc meeting, and will serve for one year. Dr. Murphy previously served on several of the ASPS's committees, accomplishing work in public education, patient safety, government affairs, and quality and performance measurement. He received his medical degree from New York University in 1982 and completed his internship and junior residency in general surgery at Beth Israel Hospital/Harvard Medical School in Boston. He went on to perform his senior residency at Morristown Memorial Hospital in New Jersey and plastic surgery training at Monteﬁore Medical Center and Albert Einstein College of Medicine in New York. "As president, I will work to ensure that the ASPS continues to serve its members' needs by offering the best educational programs, federal and state advocacy efforts, public education tools, and practice management services," said Dr. Murphy. Kevin C. Chung, MD, the Charles B. G. De Nancrede professor of surgery, plastic surgery and orthopaedic surgery at the University of Michigan, has been named president of The Plastic Surgery Foundation (The PSF). Founded in 1948, The PSF's mission is to improve the quality of life of patients through research and development in plastic surgery. "As president of The PSF, I will foster and promote creative and groundbreaking research ideas so board certiﬁed plastic surgeons can continue to bring advanced techniques and procedures to the forefront to better serve patients," said Dr. Chung. "Additionally, The PSF will increase education and access to care for patients through its advocacy work, while promoting our international volunteering efforts, patient safety programs and outcomes research projects." Syneron Completes Multisite Clinical Study For Ultrashape Contour I Syneron Medical announced that it has completed a multisite clinical study—which was agreed upon with the FDA—for the UltraShape Contour I System 32 Surgical Aesthetics ❘ January/February 2014 for abdominal circumference reduction. The system was designed to use ultrasound to disrupt fat cells noninvasively without signiﬁcantly heating the target or adjacent tissue, thereby minimizing any impact on blood vessels, nerves and muscle tissue outside the target area. In the randomized, controlled clinical study, which was performed in three clinical sites in the United States and one site outside the U.S., a total of 150 subjects were treated and followed for up to four months. An average abdominal circumference reduction of 2.4cm to 3.5cm was demonstrated. The results successfully met the primary hypothesis for clinically signiﬁcant circumference reduction. Furthermore, the results demonstrated progressive improvement over time in circumference reduction, beginning after the ﬁrst treatment session. No serious adverse events related to the device were reported. 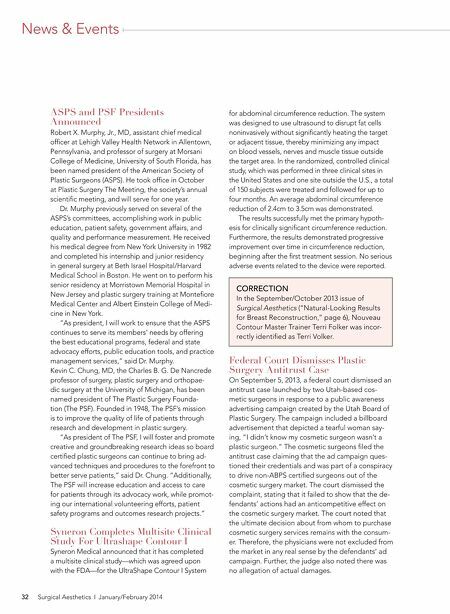 CORRECTION In the September/October 2013 issue of Surgical Aesthetics ("Natural-Looking Results for Breast Reconstruction," page 6), Nouveau Contour Master Trainer Terri Folker was incorrectly identiﬁed as Terri Volker. Federal Court Dismisses Plastic Surgery Antitrust Case On September 5, 2013, a federal court dismissed an antitrust case launched by two Utah-based cosmetic surgeons in response to a public awareness advertising campaign created by the Utah Board of Plastic Surgery. The campaign included a billboard advertisement that depicted a tearful woman saying, "I didn't know my cosmetic surgeon wasn't a plastic surgeon." The cosmetic surgeons ﬁled the antitrust case claiming that the ad campaign questioned their credentials and was part of a conspiracy to drive non-ABPS certiﬁed surgeons out of the cosmetic surgery market. The court dismissed the complaint, stating that it failed to show that the defendants' actions had an anticompetitive effect on the cosmetic surgery market. The court noted that the ultimate decision about from whom to purchase cosmetic surgery services remains with the consumer. Therefore, the physicians were not excluded from the market in any real sense by the defendants' ad campaign. Further, the judge also noted there was no allegation of actual damages.